Pace of Opinions. 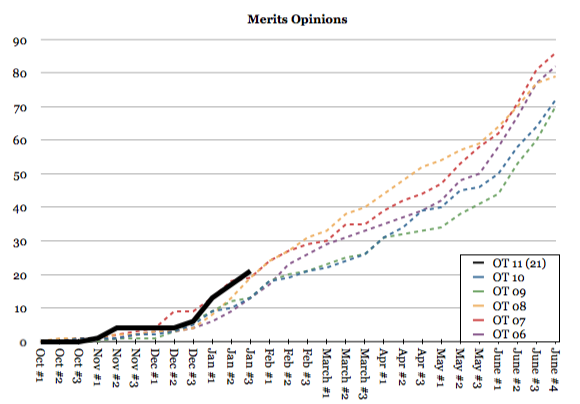 The Court has released opinions at a blistering pace through the first half of October Term 2011. Since John Roberts became the Chief Justice in 2005, the Court has not released more than 19 merits opinions through the end of the January sitting. This year, however, the Court has released 21, including blockbusters United States v. Jones and Perry v. Perez – with the latter taking only 42 days from the Court’s notation of probable jurisdiction to a decision on the merits. The Court is likely to release a mid-major, Florence v. Board of Freeholders, during the February or March sittings. Opinion Authorship. With the steady flow of opinions, the Justices have all been busy putting out opinions on a number of hot-button issues. Justice Scalia leads his colleagues with eight total opinions authored, including three majority opinions and three dissenting opinions. Justice Ginsburg has authored seven total opinions, comprised of four majority opinions and three concurring opinions. One Justice has yet to author even a single majority, concurring, or dissenting opinion: Justice Kennedy. In some ways his silence is surprising – the Court has disposed of nearly a quarter of the cases it will likely decide during OT11, but Justice Kennedy is nowhere to be found. On the other hand, he tends to write most frequently in high-profile, divided cases which often take longer to move from oral argument to published opinion. He has also traditionally written a low number of total opinions: last Term, only the Chief Justice and Justice Kagan authored fewer total opinions. However, compared to Justices Scalia and Ginsburg, who have authored eight and seven opinions, respectively, Justice Kennedy’s silence seems especially notable. Let’s take a look at how all of the Justices have fared during OT11. Despite his silence up to this point in the Term, there is no doubt that Justice Kennedy will leave his mark on the Term by the end of June. With so many landmark decisions lined up for the Term, it seems likely that Justice Kennedy will write his fair share of noteworthy majority, concurring, and dissenting opinions. 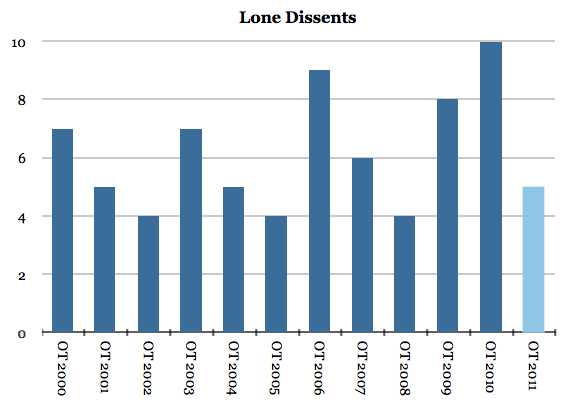 Lone Dissents. Of the 21 merits opinions that have been released during OT11, five have been 8-1 decisions, including all four opinions released on January 10. The pace of 8-1 decisions is more notable than the mere number of opinions. During the past decade, the Court has released around 5-7 8-1 decisions per Term, although that tally rose to ten last year and has fallen to four in OT02, 05, and 08. Stat Pack. We have also compiled an update to our OT11 Stat Pack. This edition features updates to reflect all opinions and orders released to date, as well as the introduction of our Justice Agreement charts. You can find it here.